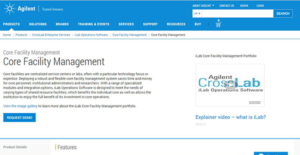 What is iLab Core Facility Management? iLab Core Facility Management is a modular facility management solution designed for centralized facility service centers and labs. It’s a robust and flexible software that enables researchers, institutional administrators, and core personnel to save resources (time and money), improve core financial management, enhance core user experience, and increase core resource utilization/awareness. The platform provides diversified modules together with specialized integration options to help multiple shared resource facilities meet their unique needs. iLab Core Facility Management automates and streamlines workflows to allow users to manage requests, inventory, and customers; monitor billing; and schedule equipment with ease. Some of its salient features include request management, business intelligence, resource scheduling, billing & invoice module, customer management, publication tracker, and resource scheduling. iLab Core Facility Management is designed to benefit the distinct core as well as permit the entire organization to relish the advantages of investing in core operations. Its resource scheduling module features an intuitive click-and-drag interface that simplifies the management of reservations. This easy-to-use interface can also be configured to manage multifaceted usage rules based on your multiple workflow requirements. The request management module is another helpful feature of iLab Core Facility Management. The feature allows you to build quotes and manage request with ease. It makes the entire request cycle (requesting a service/project, agreeing on quotes, tracking request progress, uploading data/reports) simple and streamlined. The robust system allows you to track hours spent on projects, bill individual services or sample processed before project completion, and chargeback for ad hoc expenses without a hassle. In addition, iLab Core Facility Management business intelligence module permits dynamic reporting. The module enables you to generate reports from the request, usage and billing data stored in the system. These reports can be analyzed by research administrators to asses spending and lab activities. Alternatively, they can be used by core administrators to track real-time usage, or by institution admins to monitor utilization across the cores institution-wide. Better still, iLab Core Facility Management has a powerful People Search tool designed to simplify customer management. This is an innovative people management tool which leverages advanced filtering options and associations for custom-made searches. It’s a robust tool that allows you to view customer usage, email customers directly, search customers, and download searches all in one location. If you are interested in iLab Core Facility Management it might also be a good idea to investigate other subcategories of Best Facility Management Software collected in our base of B2B software reviews. Enterprises have diverse needs and requirements and no software solution can be perfect in such a condition. It is futile to try to find an ideal off-the-shelf software app that meets all your business needs. The intelligent thing to do would be to customize the solution for your unique requirements, worker skill levels, finances, and other factors. For these reasons, do not hurry and pay for well-publicized leading systems. Though these may be widely used, they may not be the ideal fit for your unique wants. Do your groundwork, investigate each short-listed application in detail, read a few iLab Core Facility Management reviews, call the vendor for clarifications, and finally select the app that presents what you need. How Much Does iLab Core Facility Management Cost? iLab Core Facility Management offers a quote based enterprise pricing structure. Contact the vendor for a quick order or buy the software online. We realize that when you make a decision to buy Facility Management Software it’s important not only to see how experts evaluate it in their reviews, but also to find out if the real people and companies that buy it are actually satisfied with the product. That’s why we’ve created our behavior-based Customer Satisfaction Algorithm™ that gathers customer reviews, comments and iLab Core Facility Management reviews across a wide range of social media sites. The data is then presented in an easy to digest form showing how many people had positive and negative experience with iLab Core Facility Management. With that information at hand you should be equipped to make an informed buying decision that you won’t regret. What are iLab Core Facility Management pricing details? What integrations are available for iLab Core Facility Management? If you need more information about iLab Core Facility Management or you simply have a question let us know what you need and we’ll forward your request directly to the vendor.